It’s true. I’m obsessed with trying to clarify the Big Picture, referring to the full view of our human situation not only inside our ethnic and national pocket cultures, but on the planet and across evolutionary time. Much of our difficulty at present, recurring through history as we tend to get snagged on the same things time and again, is a complication of losing the Big Picture and fixating instead on the troubles at hand. It’s not that we should ignore these more local troubles and revel philosophically on only abstract and universal, but practically irrelevant things. What I mean by the Big Picture is a frame large enough to include what really needs our attention, fitted with a lens that helps us see the depths of detail and lengths of time required for making wiser, more creative and responsible choices. In this post I introduce the idea of “culture blocks,” as distinct sets or paradigms of belief, value, and aim that drive the larger process of meaning-making and world-building unique to our species. Culture can be usefully defined as the invented and almost completely imaginary construction of shared meaning that is downloaded into the consciousness of each new generation. Its construction is managed through a network of traditions, institutions, and ideologies that conspire to channel our animal instincts into outlets and expressions which not only help us get along, but also inspire the realization of our higher potential as a species. The idea of culture blocks came to me recently as I’ve been reflecting on the strange culture wars breaking out among conservatives and liberals, fundamentalists and progressives, democrats and capitalists, between those who fantasize a utopian future and others awaiting the apocalypse. As one side looks with bafflement and outrage at the other, neither can understand how anyone in their right mind could subscribe to such ridiculous, delusional, and dangerous notions. It’s not simply that they cannot agree on something they both see clearly, but that they are looking at entirely different things – or rather, that they are interpreting their situation through completely different paradigms. If your vantage point is located in a different culture block than the other guy, you will not only see things differently but your paradigm will be filtering for a very different reality. Let’s get my model in front of us and try to make sense of it. The first culture block is Morality and Religion. My arrows are indicators of time and influence, and the one coming to Morality from the left makes the point that it is probably the first element of culture to arise, with its principal line of influence coming from the past. Morality is the set of behavioral codes that a people follow in order to get along and enjoy the benefits of social life. Each new generation doesn’t have to figure these codes out for itself, but instead receives them by instruction and example. 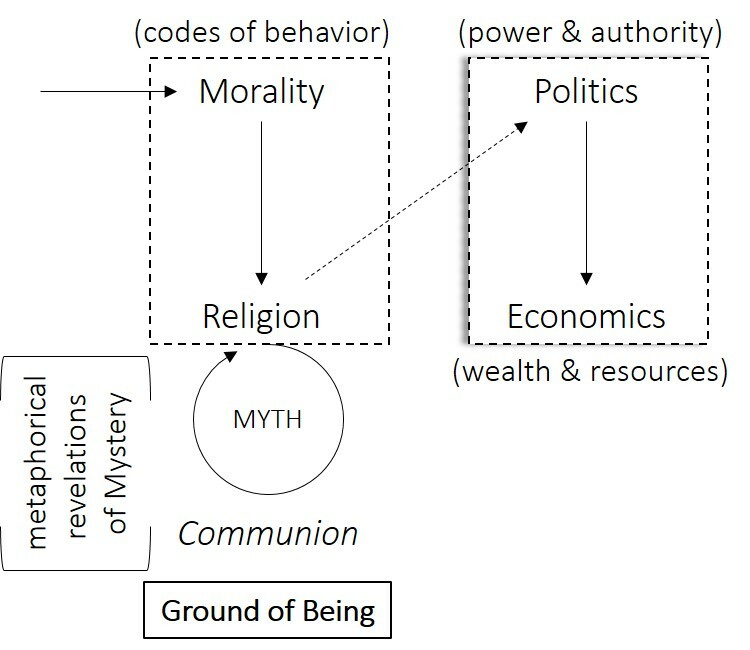 If morality carries the consensus on how we ought to behave, Religion anchors (or ‘links back’, religare) these social concerns to the deeper mystery of existence – not only of our provident support in the great web of life, but of that grounding mystery where awareness drops away from personal and temporal concerns into the timeless uplift of being-itself. 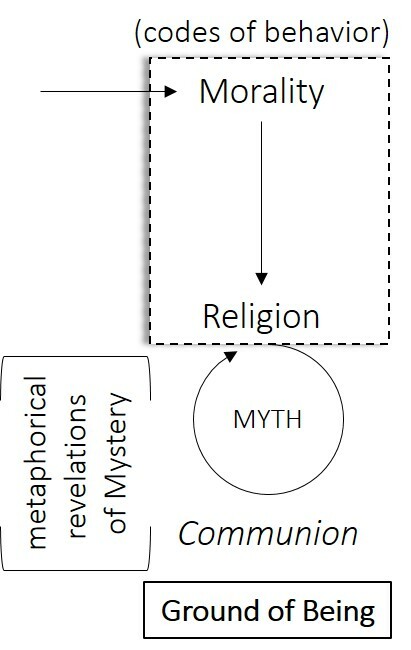 Religion carries our intuitions of the grounding mystery into metaphorical expression as myth. Its sacred stories serve as veils of meaning draping a mystery that cannot be explained but only revealed (literally unveiled) in each dramatic recital. Deep within ourselves we hold a preconscious and ineffable intuition of essential oneness (communion), and religion’s first task is spinning the narrative thread that can guide us down and back again where this intuition can be applied to daily life. Historically religion has served as the line of influence to a third element of culture, and the first in my second culture block of Politics and Economics. The arrangement of power and authority that preserves morality is given divine warrant and effectively removed from merely secular debate. Chieftains, kings, priests, presidents, and “the people” themselves are honored as endowed by god with the right to rule. By tying political power and authority to god, who personifies the deep source and support of existence itself, government is provided the ordination it needs. Especially as society grows larger and more complex, the distribution of wealth and access to natural resources becomes an increasingly pressing concern. In every example we have from history, those with wealth and resources are either in positions of political power and authority, or else use these to manipulate political leadership in their favor. The one with the gold, rules. The third culture block is Technology and Science. As necessity is the mother of invention, the need for resources has been a major driver of new technologies. Tools, instruments, machines, weapons, and sophisticated infotech are innovations that typically have their beginnings in the quest to do more with less, to turn a profit or achieve an aim with less investment of time, energy, capital, and labor. When technology for the manufacturing of tools got repurposed into instruments for the acquisition of knowledge, the scientific enterprise was born. Technology and Science have been co-evolving for millenniums, and the resulting alterations to our cosmology (or model of reality) over that time have been truly revolutionary. By formulating and testing mathematical explanations of order on all scales of magnitude, our knowledge of the universe has grown exponentially. Now we can place the three culture blocks side by side on a timeline to complete my picture. 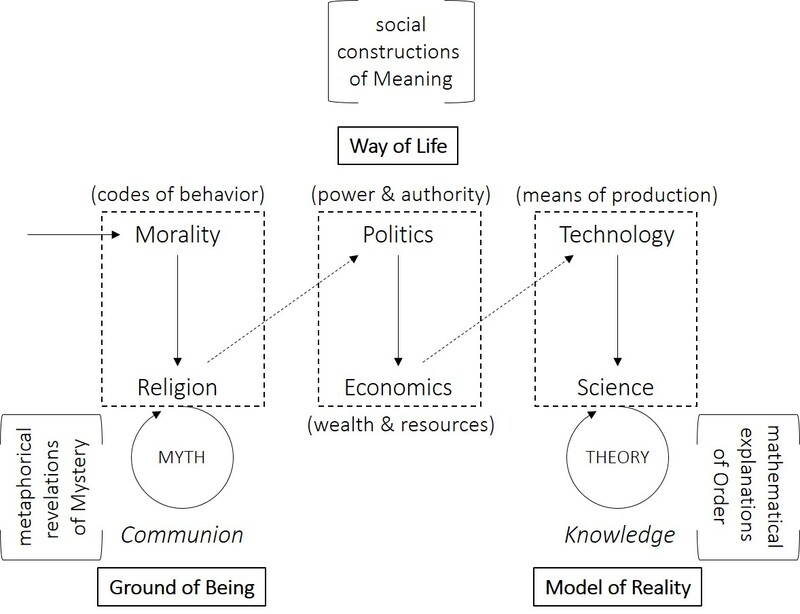 Each block serves to connect society to a dimension of time: Morality and Religion to the past for anchorage; Politics and Economics to the present challenge of government; Technology and Science to the future of progress. 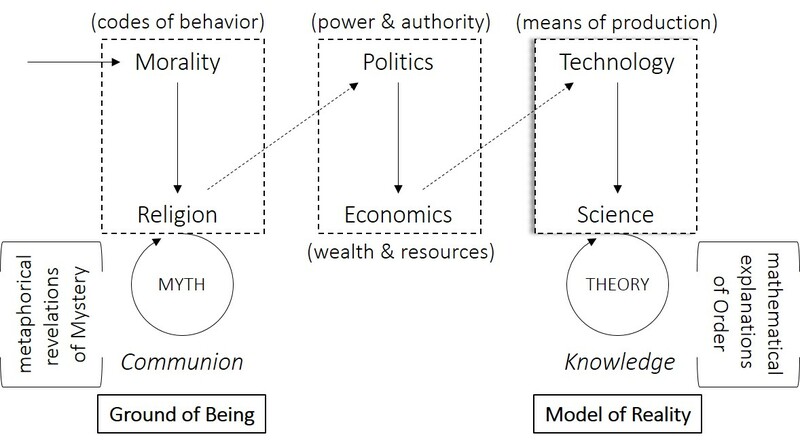 Together religion and science compose the narratives (i.e., religious myths and scientific theories) that weave our social construction of meaning. By this map we chart our way of life. An interesting dynamic has been unfolding over the past 2,300 years or so, as updates and revolutions in our scientific model of reality have completely reconstructed the cosmological frame on which religion draped its great myths. The transformation from a vertically oriented (up and down) three-story universe to a radially oriented (out and across) expanding cosmos has complicated our ability to take the myths seriously anymore. Many are siding with science and against religion, while others are insisting that the myths aren’t myths at all – now a synonym for superstition and fallacy – but rather factual accounts of supernatural realms, metaphysical entities, and miraculous events. As I have tried to show in other posts, both sides are misinterpreting what originally were (and still are, if we can recover our spiritual intuition) metaphorical depictions of the essential oneness in which we live and move and have our being. Back to my starting observation about the back-and-forth misunderstanding between conservatives and liberals, fundamentalists and progressives, democrats and capitalists, dreamers and doomsayers. While many of them have important things to say, they may not realize that they are using very different filters (i.e., paradigms, or my term culture blocks) in their constructions of meaning. Consequently they can’t understand each other, which removes any possibility of reaching agreement and living in peace. Perhaps if we can engage in dialogue fully conscious of where (i.e., in which block) our beliefs, values, and aims are located, we might make some headway together. And by acknowledging that our preferred vantage point is not the only place from which an intelligent perspective can be held, the larger discourse of culture has a better chance of including us all.